We’re heading north to Seattle for the annual Northwest Flower & Garden Show. This year the show runs now through February 24th. http://www.gardenshow.com/ It’s showtime across the country, and it’s the best place to hear speakers, buy new plants and especially in Seattle we always find inspiration from the fabulous show gardens. I’ll be speaking and doing a 1:30 demonstration on edible gardening in containers at the NW Horticulture Society garden located in the entry. 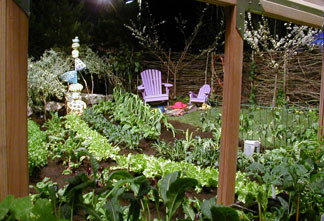 I can hardly wait to see this four part garden “Eat Your Vegetables! Garden to Table “. I’ve designed and worked on gardens at this show. It’s pretty amazing backstage when trucks drive onto the fourth floor of the Washington Convention Center as construction begins. It’s a breakneck pace starting on Saturday and finishing at noon on Tuesday when judging begins. This year I’m a wide-eyed tourist and the show always makes me happy. Our venture into straw bale gardening began with a garden promoting Plant A Row For the Hungry, a program of the Garden Writers Association. PAR encourages gardeners to contribute their surplus produce to local food banks, soup kitchens and shelters. These organizations are always short of fresh produce so look into sharing your surplus. Suddenly the days are longer, the skies are brighter, and it’s a joy to be in the garden. This week I sowed Cascadia Snap Pea seeds in a straw bale. Legume inoculant will provide all the nitrogen they need. Gardeners in the Pacific Northwest once had to plant peas in January to get a crop because aphids transmit Pea Enation Mosaic virus. Enation diseased plants begin drying out and stop producing as soon as we have a trace of hot weather in early summer. Gardeners would rush to plant in January, no matter how cold and wet the conditions. My mother always referred to early pea planting as “mudding in”. Plant breeders at Oregon State University began selecting for resistance to this disease over forty years ago. Today, we can plant OSU Sugar Pod II, Oregon Giant Sugar Pod, Cascadia Snap Pea, and Oregon Trail shelling pea, all released from the OSU department of horticulture and bred by Dr. James Baggett. OSU sugar Pod II is now the most widely grown edible pod variety in the world. It has good flavor, is tender crisp, and easy to grow and harvest. February 15th, 16th & 17th, you’ll find Nichols Garden Nursery at booth #1386 at the beautiful Portland Yard, Garden, & Patio Show. Sunday, at 11:00 a.m. I’ll present a seminar on “Culinary Herbs: How to Grow and Use In the Pacific Northwest”. YGP, gets us enthused about the beginning of spring. With lovely display gardens, free seminars, vendors offering fantastic selections of plants, seeds, bulbs, this is the place and time Oregon and Southern Washington gardeners gather to shop, learn, relax and plan their garden year. The Oregon Convention Center has good parking, benches to relax, and such a nice ambience that the entire show makes me feel like I’m already in a garden. Come by our booth and mention you’ve seen our blog or website and pick up a free packet of spinach or sunflower seed. We’ll have seeds, gardening products, catalogs and we’re ready to answer your gardening questions. 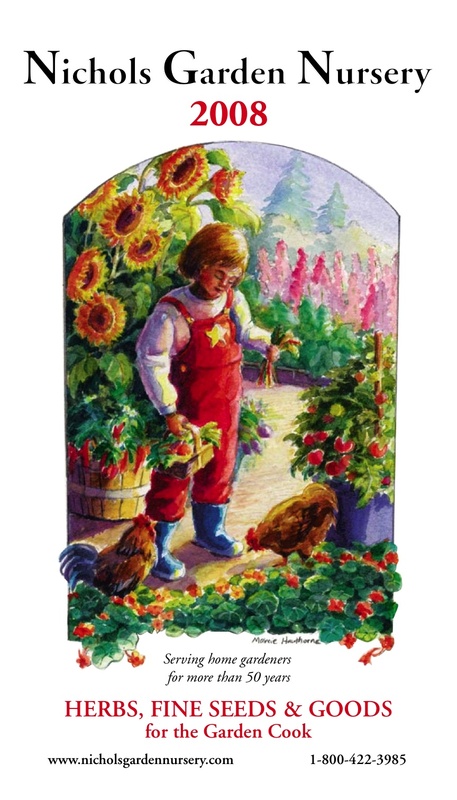 If you have a little extra garden space and are concerned about local hunger issues, we’d like to explain Plant A Row For the Hungry, a program of the Garden Writers Association. We can offer you a choice of seed packets to get you started. Collectively, participants raise thousands of pounds of produce for local food banks and soup kitchens where fresh vegetables for those in need are always appreciated. Nichols Garden Nursery, in Albany, Oregon now has a new 88 page, 2008 catalog. Our new narrower format is easy to handle and read. If you visit our website http://www.nicholsgardennursey.com you can download this catalog as a PDF. Be sure to check the “new and unusual” pages 23 & 24 for what’s new in seeds. We maintain an eclectic selection of good tasting, easy to grow home garden varieties. Some seeds are organically certified, some heirloom, and some hybrid. We offer the best. None of our seeds are treated or genetically modified. You can request a catalog from the website or use our PDF to plan your garden.